Let me first just say that I was dreading this show. A friend of mine asked if I was going and sort-of persuaded me when I told her I was on the fence. I then bought the ticket. Time passed. His new record Mature Themes came out. Then, SPIN and Pitchfork both put out features on him. I couldn’t get through his record and I became infatuated with pointing out his flaws. Easily one of the strangest people to become famous yesterday, in the end I couldn’t pass up a chance to see him in the flesh and get an eye full of what I’m sure would be a strange crowd. At times I felt like I was at a carnival. Probably due to the twinkle Christmas lights that stood behind him. Or maybe it was the strobe light and smoke. Other times it was a jazzercise class. Pink was wearing blue spandex and a purple satin bathrobe, both of which only highlighted how thin he is. He wandered around the stage like a drunken uncle at a family party. He helped adjust Korg nobs on one side and conducted and taunted the bassist on the other. When Pink lashed into the first song (fifteen minutes late) I burst out laughing. I couldn’t stop myself. It wasn’t until I looked around and saw the enthusiastic crowd that I managed to control myself. No one seemed to care about anything at all in the world – except for this show. The jazzercise feeling was induced by the jumping up and down and flailing going on around me. Aside from quintessential townies and women in head scarves, the crowd was teenage young. People were dancing as if they were alone in their living room with no one watching. They mimicked what was happening on stage. When Pink was adjusting nobs and sitting on the floor next to the drummer, no one moved. When he thrashed out, a mosh pit started. And then there was the time he crowd surfed. First I thought he was finally going to make moves on the guy who had been throwing his hands and beer at the stage all night. Then I realized he was crawling over the amps and getting a hold for the crowd to come together. I was able to snap some shots of this until I realized he was headed right towards me. As I held him up, I realized how thin he really is. (Imagine Ewan McGregor in Trainspotting thin.) The entire moment was very surreal. It was a euphoric climax of synths and dreams during a song I didn’t recognize at first (and I couldn’t tell you what it was now.) All I wanted was to get a good look at him. And here he was, quite literally, singing on top of me. The band plowed through the hits, “Bright Lit Blue Skies”, “Hot Body Rub,” “Round and Round,” and of course the new “Only In My Dreams.” Everyone was electric over it and went nuts at the beginning of every song. The thing about the Haunted Graffiti is they’re a great band. It sounds like they’ve been playing together forever. I was so mesmerized by the bassist at points I had to stop myself from staring. Probably the best bassist I’ve seen live this year, it looked like the only thing he’s ever done is play the bass – methodically and effortless. Two guitarists, one on each side, man handled synthesizers all night and contributed vocals. The drummer was tight knit and followed Pink’s directions fluidly. Other tracks like “L’Estat (Acc. to the Widow’s Maid)” and “Is This The Best Spot?” filled out their hour and half long set, which at times felt annoyingly long in moments of excess droning and white noise. Pink’s babbling was at times distinguished. Even though I had heard about his past meltdowns he’s had during performances, it seemed like he planned every move at this one: part psychedelia and part side-show. Pink’s face was so animated and his ability to engage the crowd was extensive. Space on the floor was thick and thin. You could maneuver around effortlessly or get trapped in a dance cycle. During “Friday Night (Nevermore)” (and almost every song) the crowd was louder than him at times and constantly cheered him on. When people tell you about live shows that helped change their impression of a band, it’s hard to believe them until it’s happened to you. It always comes along unexpected for that’s the nature of the beast. Yuck certainly did that for me when I saw them two years ago at the Black Cat opening for Tame Impala. 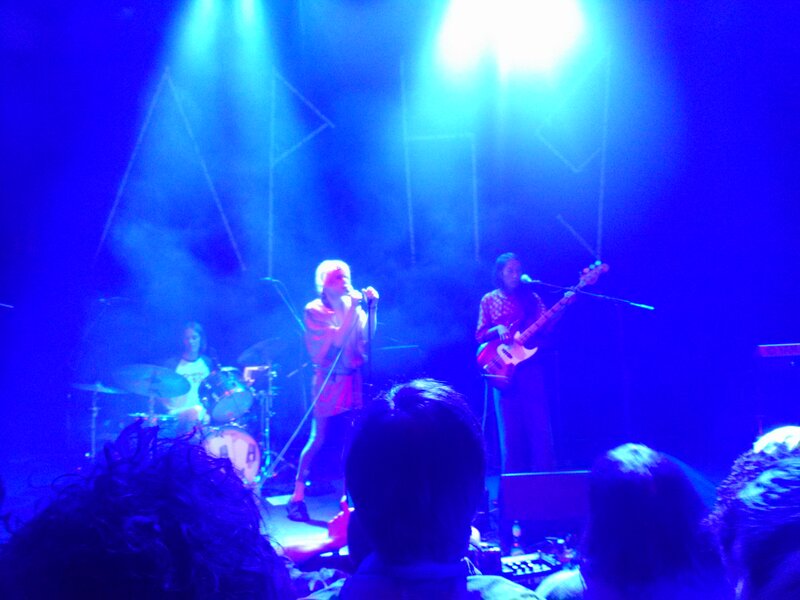 Ariel Pink’s Haunted Graffiti live is something I won’t ever forget. And I could spend forever analyzing it, which I probably will. But in the end, we’ve come ‘all this way’ for music to be whatever it wants to be. Lucid and uneasy, Ariel Pink has certainly captured that.